If you’re like us, you don’t need a reason to celebrate dark chocolate, but it sure is sweet to have one. National Dark Chocolate Day on February 1 is an opportunity exalt the health and happiness that dark chocolate brings and pay homage to the history and cultural significance surrounding this decadent treat. Chocolate was first used as a food in mesoamerica. Chocolate arrives in Europe and sugar is added for the first time. The first instance of dark chocolate being found in bar form. Milton S. Hershey first purchases chocolate processing equipment and starts Hershey's chocolates. You don't need an excuse to support one of your local chocolate shops, but on National Dark Chocolate Day why not indulge on all the beautiful desserts in the case. While even the most novice bakers can make something delicious with dark chocolate, it still offers seasoned bakers a chance to test their skills. Regardless of your skill level, try your hand at a babka, molten cake, or pain au chocolat and even if it doesn't come out perfectly, just eat the evidence. Who needs three courses when dessert is clearly the best? Chocolate-themed restaurants are popping up in cities across the country offering unique and creative uses for our favorite confection. Believed by the Aztecs to be a gift from Quetzalcoatl, the god of wisdom, chocolate was originally a fermented beverage that gave the drinker strength. Chocolate is derived from the Aztec language of Nahuatl word "chocolātl" which means "bitter drink." 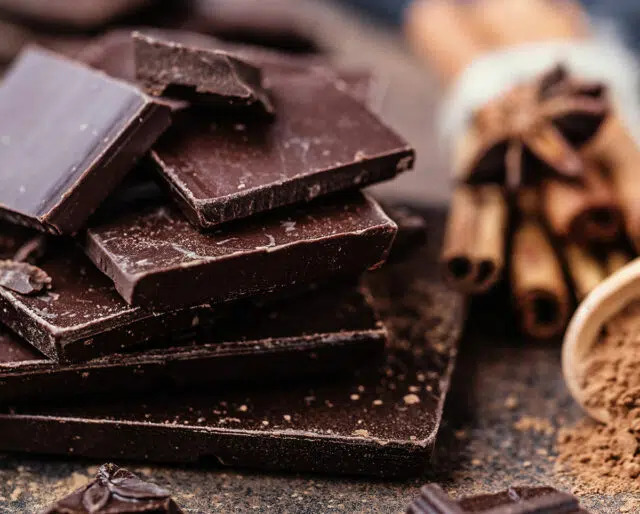 Thanks to its high percentage of cocoa and lower amounts of sugar and milk, dark chocolate's health benefits have made it a potential superfood. About two-thirds of cocoa in the world is produced in Western Africa with the Ivory Coast being the largest source of the crop. That's over 11 pounds per person. Potassium, zinc, magnesium, oh my! Dark chocolate contains vitamins and minerals that the body needs. It is also rich in powerful anti-oxidants called flavonoids that promote healthy circulation and prevents plaque formation in the arteries. Dark chocolate contains tryptophan and phenylethylamine, two chemicals known to tell your brain to release pleasure causing endorphins. This feeling of euphoria is often compared with the feeling of being in love. Chocolate's low melting point makes it perfect for use in baking and there are tons of ways to incorporate the sweet treat. Whether you've got panache for ganache or freak out for fudge, break out that double boiler and get melting.